For other uses, see All My Sons (disambiguation). All My Sons is a 1947 play by Arthur Miller. It opened on Broadway at the Coronet Theatre in New York City on January 29, 1947, closed on November 8, 1949 and ran for 328 performances. It was directed by Elia Kazan (to whom it is dedicated), produced by Elia Kazan and Harold Clurman, and won the New York Drama Critics' Circle Award. It starred Ed Begley, Beth Miller, Arthur Kennedy, and Karl Malden and won both the Tony Award for Best Author and the Tony Award for Best Direction of a Play. The play was adapted for films in 1948 and 1987. Miller wrote All My Sons after his first play The Man Who Had All the Luck failed on Broadway, lasting only four performances. Miller wrote All My Sons as a final attempt at writing a commercially successful play; he vowed to "find some other line of work" if the play did not find an audience. All My Sons is based upon a true story, which Arthur Miller's then mother-in-law pointed out in an Ohio newspaper. The news story described how in 1941–43 the Wright Aeronautical Corporation based in Ohio had conspired with army inspection officers to approve defective aircraft engines destined for military use. The story of defective engines had reached investigators working for Sen. Harry Truman's congressional investigative board after several Wright aircraft assembly workers informed on the company; they would later testify under oath before Congress. In 1944, three Army Air Force officers, Lt. Col. Frank C. Greulich, Major Walter A. Ryan, and Major William Bruckmann were relieved of duty and later convicted of neglect of duty. Henrik Ibsen's influence on Miller is evidenced from the Ibsen play The Wild Duck, where Miller took the idea of two partners in a business where one is forced to take moral and legal responsibility for the other. This is mirrored in All My Sons. He also borrowed the idea of a character's idealism being the source of a problem. The criticism of the American Dream, which lies at the heart of All My Sons, was one reason why Arthur Miller was called to appear before the House Un-American Activities Committee during the 1950s, when America was gripped by anti-communist sentiment. Miller sent a copy of the play to Elia Kazan who directed the original stage version of All My Sons. Kazan was a former member of the Communist Party who shared Miller's left-wing views. However, their relationship was destroyed when Kazan gave names of suspected Communists to the House Un-American Activities Committee during the Red Scare. Joe Keller — Joe, 60, was exonerated after being charged with knowingly shipping damaged aircraft engine cylinder heads (for Curtiss P-40 Warhawks) from his factory to the military during World War II, causing the deaths of twenty one pilots. For three and a half years he has placed the blame on his partner and former neighbor, Steve Deever. When the truth comes out, Joe justifies his actions by claiming that he did it for his family. Kate Keller (Mother) — Kate knows that Joe is guilty but lives in denial while mourning for her older son Larry, who has been MIA for three years. She refuses to believe that Larry is dead and maintains that Ann Deever — who returns for a visit at the request of Larry's brother Chris — is still "Larry's girl" and also believes that he is coming back. Chris Keller — Chris, 32, returned home from World War II two years before the play begins, disturbed by the realization that the world was continuing as if nothing had happened. He has summoned Ann Deever to the Keller house in order to ask her hand in marriage, but they're faced with the obstacle of Kate's unreasonable conviction that Larry will someday return. Chris's idolizes his father, not knowing initially what he has done. Ann Deever — Ann, 26, arrives at the Keller home having shunned her "guilty" father since his imprisonment. Throughout the play, Ann is often referred to as pretty, beautiful, and intelligent-looking and as "Annie". She had a relationship with Larry Keller before his disappearance, and has since moved on because she knows the truth of his fate. She hopes that the Kellers will consent to her marriage to Larry's brother, Chris, with whom she has corresponded by mail for two years. Ann is the knowledge-bearer in the play. George Deever — George, 31, is Ann's older brother: a successful New York lawyer and WWII veteran, and a childhood friend of Chris'. He initially believed in his father's guilt, but upon visiting Steve in jail, realizes his innocence and becomes enraged at the Kellers for deceiving him. He returns to save his sister from her marriage to Chris, creating the catalyzing final events. Dr. Jim Bayliss — Jim is a successful doctor, but is frustrated with the stifling domesticity of his life. He wants to become a medical researcher, but continues in his job as it pays the bills. He is a close friend to the Keller family and spends a lot of time in their backyard. Sue Bayliss — Sue is Jim's wife: needling and dangerous but affectionate, she too is a friend of the Keller family, but is secretly resentful of what she sees as Chris's bad idealistic influence on Jim. Sue confronts Ann about her resentment of Chris in a particularly volatile scene. Frank Lubey — Frank, 33, was always one year ahead of the draft, so he never served in World War II, instead staying home to marry George's former sweetheart, Lydia. He draws up Larry's horoscope and tells Kate that Larry must still be alive, because the day he died was meant to be his "favorable day". This strengthens Kate's faith and makes it much harder for Ann. Lydia Lubey — Lydia, 27, was George's love interest before the war; after he went away, she married Frank and they quickly had three children. She is a model of peaceful domesticity and lends a much-needed cheerful air to several moments of the play. Bert — Bert is a little boy who lives in the neighborhood; he is friends with the Bayliss' son Tommy and frequently visits the Kellers' yard to play "jail" with Joe. He only appears twice in the play. The first time he appears, his part seems relatively unimportant, but the second time he appears his character gets more important as he sparks a verbal attack from mother when mentioning "jail," which highlights Joe's secret. Larry Keller —Larry has been MIA for some years at the start of the play. However he has a significant effect in the play through his mother's insistence that he is still alive and his brother's love for Larry's childhood sweetheart, Ann. Comparisons are also made in the story between Larry and Chris; in particular, their father describes Larry as the more sensible one with a "head for business". Steve Deever — George and Ann's father. Steve is sent to prison for the shipping of faulty aircraft parts—a crime which not only he but also the exonerated Keller committed. The play starts in the middle of the action, abruptly. In August 1947, Joe Keller, a self-made businessman, and his wife Kate are visited by a neighbor, Frank. At Kate's request, Frank is trying to figure out the horoscope of the Kellers' missing son Larry, who disappeared three years earlier while serving in the military during World War II. There has been a storm and the tree planted in Larry's honor has blown down during the month of his death, making it seem that Larry is still alive. While Kate still believes Larry is coming back, the Kellers' other son, Chris, believes differently. Furthermore, Chris wishes to propose to Ann Deever, who was Larry's girlfriend at the time he went missing and who has been corresponding with Chris for two years. Joe and Kate react to this news with shock but are interrupted by Bert, the boy next door. He tattles to Joe and wants to see the "jail". In a game, Bert brings up the word "jail", making Kate react sharply. When Ann arrives, it is revealed that her father, Steve Deever, is in prison for selling cracked cylinder heads to the Air Force, causing the deaths of 21 pilots in plane crashes. Joe was his partner but was exonerated of the crime. Ann admits that neither she or her brother keep in touch with their father any more and wonders aloud whether a faulty engine was responsible for Larry's death. After a heated argument, Chris breaks in and later proposes to Ann, who accepts. Chris also reveals that, while leading a company, he lost all his men and is experiencing survivor's guilt. Meanwhile, Joe receives a phone call from George, Ann's brother, who is coming there to settle something. Although Chris and Ann have become engaged, Chris avoids telling his mother. Their next door neighbor Sue emerges, revealing that everyone on the block thinks Joe is equally guilty of the crime of supplying faulty aircraft engines. Shortly afterwards, George Deever arrives and reveals that he has just visited the prison to see his father Steve. The latter has confirmed that Joe told him by phone to cover up the cracked cylinders and to send them out, and later gave a false promise to Steve that he would account for the shipment on the day of arrest. George insists his sister Ann cannot marry Chris Keller, son of the man who destroyed the Deevers. Meanwhile, Frank announces his horoscope, implying that Larry is alive, which is just what Kate wants to hear. Joe maintains that on the fateful day of dispatch, the flu laid him up, but Kate reveals that Joe has not been sick in fifteen years. Despite George's protests, Ann sends him away. When Kate dismally claims to Chris (still intent on marrying Ann) that moving on from Larry will be forsaking Joe as a murderer, Chris concludes that George was right. Joe, out of excuses, explains that he sent out the cracked airheads to avoid closure, intending to notify the base later that they needed repairs. However, when the fleet crashed and made headlines, he lied to Steve and left him at the shop for arrest. Chris cannot accept this, and roars despairingly that he is torn about what to do with his father now. Chris has gone missing. Reluctantly accepting the ubiquitous accusations, Kate says that, should Chris return, Joe must express willingness to go to prison in hope that Chris will relent. As he only sought to make money at the insistence of his family, Joe is adamant that their relationship is above the law. Soon after, Ann emerges and expresses intent to leave with Chris regardless of Kate's disdain. When Kate angrily refuses again, Ann reveals to Kate a letter from Larry. She had not wanted to share it, but knows that Kate must face reality. Chris returns, and is torn about whether to bring Joe in himself, knowing it doesn't erase the death of his fellow soldiers or absolve the world of its natural merciless state. When Joe returns and refutes his guilt on account of his life's accomplishments, his son wearily responds, "I know you're no worse than other men, but I thought you were better. I never saw you as a man...I saw you as my father." Finally, the letter, read by Chris, reveals that because of his father's guilt, Larry planned to commit suicide. With this final blow, Joe finally agrees to turn himself in, goes inside to get his coat but then kills himself with a gunshot. At the end, when Chris expresses remorse in spite of his resolve, Kate tells him not to blame him and to live onward. The precise date of events in the play are unclear. However it is possible to construct a timeline of All My Sons using the dialogue. The action takes place in August 1946, in Midwestern United States with the main story taking place on a Sunday morning. Arthur Miller's writing in All My Sons often shows great respect for the great Greek tragedies of the likes of Aeschylus, Sophocles and Euripides. In these plays the tragic hero or protagonist will commit an offense, often unknowingly, which will return to haunt him, sometimes many years later. The play encapsulates all the fallout from the offense into a 24-hour time span. During that day, the protagonist must learn his fate and suffer as a result, and perhaps even die. In this way the gods are shown to be just and moral order is restored. In All My Sons, these elements are all present; it takes place within a 24-hour period, has a protagonist suffering from a previous offense, and the punishment for that offense. Additionally, it explores the father-son relationship, also a common theme in Greek tragedies. Ann Deever could also be seen to parallel a messenger as her letter is proof of Larry's death. In Joe Keller, Arthur Miller creates just a representative type. Joe is a very ordinary man, decent, hard-working and charitable, a man no one could dislike. But, like the protagonist of the ancient drama, he has a flaw or weakness. This, in turn, causes him to act wrongly. He is forced to accept responsibility – his suicide is necessary to restore the moral order of the universe, and allows his son, Chris, to live free from guilt and persecution. Arthur Miller later uses the Everyman in a criticism of the American Dream in Death of a Salesman, which is in many ways similar to All My Sons. The success of a play, especially one's first success, is somewhat like pushing against a door which suddenly opens from the other side. One may fall on one's face or not, but certainly a new room is opened that was always securely shut until then. For myself, the experience was invigorating. It made it possible to dream of daring more and risking more. The audience sat in silence before the unwinding of All My Sons and gasped when they should have, and I tasted that power which is reserved, I imagine, for playwrights, which is to know that by one's invention a mass of strangers has been publicly transfixed. 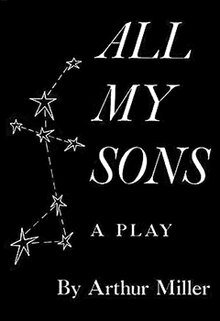 In 1987, the Broadway revival of All My Sons won the Tony Award for Best Revival of a Play starring Richard Kiley (Tony Award nominee for Best Actor in a Play), Joyce Ebert, Jamey Sheridan (Tony Award nominee for Best Featured Actor in a Play) and Jayne Atkinson. It was produced by Jay H. Fuchs and Steven Warnick in association with Charles Patsos. It was originally produced by The Long Wharf Theatre (M. Edgar Rosenblum, Executive Director, Arvin Brown, Artistic Director). The production was directed by Arvin Brown, scenic design by Hugh Landwehr, costume design by Bill Walker, and lighting design by Ronald Wallace. It opened on April 22, 1987, at the John Golden Theatre and closed May 17, 1987. In the 2000–2003 season, it was staged by the management of Burçin Oraloğlu at Istanbul Metropolitan Municipality City Theaters. The characters were played by Erhan Abir (Joe), Celile Toyon (Kate), Burak Davutoğlu (Chris Keller), and Aslı Seçkin (Ann). A Broadway revival began previews at the Gerald Schoenfeld Theatre on September 18, 2008, and officially opened on October 16, 2008. The limited engagement ran through until January 4, 2009. The production starred John Lithgow, Dianne Wiest, Patrick Wilson, and Katie Holmes, in her Broadway debut. The other featured actors were Becky Ann Baker, Christian Camargo, Jordan Gelber, Danielle Ferland, Damian Young, and Michael D'Addario. It was directed by Simon McBurney. The creative team consisted of scenic and costume design by Tom Pye, lighting design by Paul Anderson, sound design by Christopher Shutt and Carolyn Downing, projection design by Finn Ross, and wig and hair design by Paul Huntley. McBurney's direction of All My Sons grew out of a meeting with Arthur Miller in 2001, shortly after the playwright saw the New York premiere of Mnemonic. Miller’s daughter, Rebecca Miller, asked McBurney to direct the play. Some controversy surrounded the production, as the internet group Anonymous staged an anti-Scientology protest at the first night of preview performances in New York City (due to cast member Katie Holmes). The cast dedicated their performance on September 27 to the actor Paul Newman, who died the day before. David Suchet and Zoë Wanamaker (both stars of the British TV series Agatha Christie's Poirot) starred in a revival production at the Apollo Theatre in London's West End. Suchet played Joe Keller and Wanamaker played his wife Kate. The production also featured Jemima Rooper as Ann Deever and Stephen Campbell Moore as Chris Keller. The show ran from May until September 11, 2010; one performance was captured live and can be viewed online. Michael Buffong, the artistic director of Talawa Theatre Company, directed the play at the Royal Exchange Theatre in Manchester. It starred Don Warrington as Joe Keller, Doña Croll as Kate Keller, Chike Okonkwo as Chris Keller, Kemi-Bo Jacobs as Ann Deever and Simon Coombs as George Dever. Ray Shell and Doña Croll led this revival by Talawa Theatre Company for a national tour of the UK. Shell played Joe Keller and Croll played his wife Kate. The production also featured Kemi-Bo Jacobs as Ann Deever and Leemore Marrett Jr as Chris Keller. The tour started in February and ran until April 25, 2015. On June 5, 2017 it was announced that Fiona Buffini would direct a new production of All My Sons for Nottingham Playhouse in October 2017. From May 28 to June 3, 2017 All My Sons was performed at The Geoffrey Whitworth Theatre. Joe Keller was played by Richard Self and Kate Keller by Jennifer Sims. In April, May, and June of 2019, Sally Field and Bill Pullman will star in a revival at the Old Vic Theatre alongside Jenna Coleman and Colin Morgan. The production will be directed by Jeremy Herrin. A Broadway revival presented by the Roundabout Theatre Company at the American Airlines Theatre began previews on April 4, 2019 and officially will open on April 22. Tracy Letts (Joe), Annette Bening (Kate) and Benjamin Walker (Chris) star. The production was originally to be directed by Gregory Mosher, but after a casting dispute between Mosher and the estate of Arthur Miller he was replaced by Jack O'Brien. All My Sons was first adapted into a film in 1948. Edward G. Robinson played Joe Keller. It was directed by Irving Reis and gained two award nominations, Best Written American Drama and The Robert Meltzer Award for the film's co-writer Chester Erskine. In the film, Steve Deever is renamed Herbert Deever, and makes an onscreen appearance, played by actor Frank Conroy. In 1950, Lux Radio Theater broadcast a radio play of All My Sons with Burt Lancaster as Joe. The play was adapted by S. H. Barnett and, in an interesting twist, featured the character of Steve Deever in a speaking role. In 1958, the play was adapted for television by Stanley Mann and directed by Cliff Owen. This production starred Albert Dekker as Joe Keller, Megs Jenkins as Kate Keller, Patrick McGoohan as Chris Keller and Betta St. John as Ann Deever. In 1987, All My Sons was made into a made-for-TV film. This version is more faithful to Arthur Miller's original play than the 1948 film version. The main roles are James Whitmore as Joe Keller, Aidan Quinn as Chris Keller, Michael Learned as Kate Keller and Joan Allen as Ann Deever. Direction was by Jack O'Brien. Unlike the 1948 version, this version refers to George's father as Steve as in the play rather than Herb or Herbert. In 1998, L.A. Theatre Works put on an unabridged radio production for broadcast on Voice of America and NPR. The play starred Julie Harris as Kate Keller, James Farentino as Joe Keller and Arye Gross as Chris Keller. All My Sons was the inspiration for the name of the popular band Twenty One Pilots. ^ a b c "Study Guide: All My Sons – About". GradeSaver. 2008. Archived from the original on June 12, 2008. Retrieved June 15, 2008. ^ "All My Sons Details". The Internet Broadway Database. 2008. Archived from the original on March 2, 2007. Retrieved June 15, 2008. ^ "Study Guide: All My Sons – Section 6". GradeSaver. 2008. Archived from the original on July 4, 2008. Retrieved June 15, 2008. ^ "Elia Kazan Biography". The Internet Movie Database. 2008. Retrieved June 15, 2008. ^ Andrew Moore (2008). "Studying Arthur Miller's All My Sons". Universal Teacher. Archived from the original on June 10, 2008. Retrieved June 15, 2008. ^ a b "All My Sons". Internet Broadway Database. The Broadway League. Retrieved February 10, 2018. ^ Cox, Gordon (September 2, 2008). "Anti-Scientology org aims at 'Sons'". Variety. Variety Media, LLC. Retrieved February 10, 2018. ^ "Digital Theatre:: the best of British theatre – watch online or download to your desktop". ^ "All My Sons tour marks Arthur Miller centenary". BBC News. ^ "All My Sons (Tour) – 'Michael Buffong ratchets up the tension'". ^ "All My Sons – Review – Theatre – The Stage". ^ "The GWT – All My Sons – Season 2017". www.thegwt.org.uk. Retrieved October 11, 2018. ^ "ALL MY SONS Cast | The Old Vic". The Old Vic. Retrieved October 11, 2018. ^ Clement, Olivia (September 20, 2018). "Annette Bening and Tracy Letts to Star in Broadway Revival of All My Sons | Playbill". Playbill. Retrieved October 11, 2018. ^ McPhee, Ryan (December 18, 2018). "Jack O'Brien Steps in as Broadway's All My Sons Director, Replacing Gregory Mosher After Casting Dispute". Playbill. Retrieved December 19, 2018. ^ Clement, Olivia (April 4, 2019). "All My Sons, Starring Annette Bening, Tracy Letts, and Benjamin Walker, Begins on Broadway". Playbill. Retrieved April 8, 2019. ^ "All My Sons (1948) - Overview". TCM.com. ^ "Lux Radio Theater – All My Sons (05-01-50)". Archived from the original on April 1, 2009. Retrieved April 1, 2009. ^ "All My Sons (1958)". bfi.org,uk. Retrieved April 8, 2019. ^ "All My Sons". January 19, 1987 – via IMDb. ^ "All My Sons (1987) - Overview". TCM.com. ^ "L.A. Theatre Works". Drama Online. Retrieved April 8, 2019. ^ "Audiobook is not available - Audible.com". Wikimedia Commons has media related to All My Sons.